If you are an Alice In Wonderland fan that likes summer then you should check out these Cheshire Cat shorts. The black women’s shorts are available in a wide range of sizes going from size 0 to size 19 and the shorts are made from 98% cotton and 2% spandex. 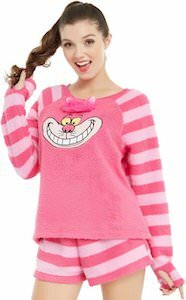 On the black shorts, you can see a patch on one side that shows the Cheshire Cat and a teacup and the other side shows a pink patch that says “We’re All Mad Here”. These black Alice In Wonderland shorts are just fun for summer and have pockets on the front and back so that you can even bring some small things without the need of a purse.